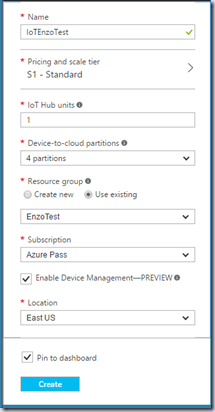 In this post, I will explain how you can easily simulate dozens (or hundreds) of IoT devices to test your Azure IoT Hub configuration. Simulating IoT devices with dynamic data can help you test your Azure IoT Hub configuration settings, along with downstream consumers such as Stream Analytics and Power BI reports. 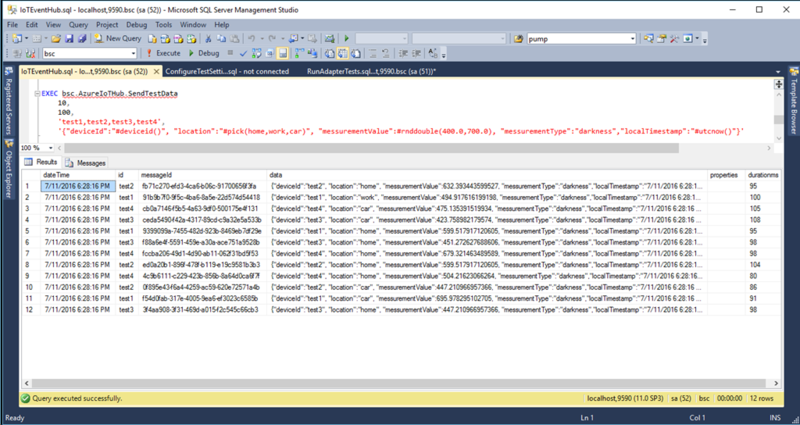 In order to facilitate the communication between SQL Server and an Azure IoT Hub, we will use Enzo Unified (http://www.enzounified.com) which abstracts the underlying cloud APIs, allowing native SQL commands to be executed against the Azure IoT Hub. With Enzo Unified, simulating dozens of IoT devices can be done with a simple T-SQL statement. We will use SQL Server to drive test cases (simulating devices) by running SQL scripts, and Enzo Unified as a bridge allowing the SQL scripts to send data to the Azure IoT Hub from SQL Server directly. Let's first configure our Azure IoT Hub. When the IoT Hub has been created (this make take a few minutes) click Settings on your IoT Hub page. Under Settings, select Shared Access Policies, and select the iothubowner policy; the Shared Access Keys will be displayed. 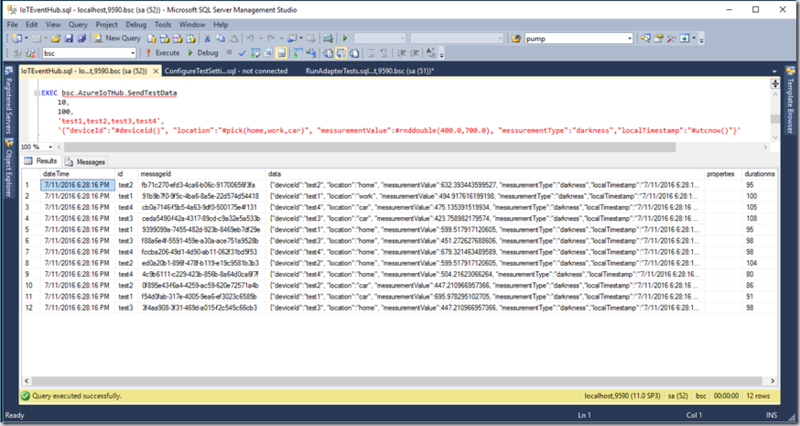 In this section, we will configure Enzo Unified to connect to the Azure IoT Hub service using SQL Server Management Studio (SSMS). Enzo Unified will serve as the bridge between SQL Server and the Azure IoT Hub environment by allowing SQL Server to send test messages to Azure. You are now ready to access the hub through Enzo Unified. If you need to update the configuration settings, use the _configUpdate command (same parameters); then use the _configFlush command to apply the new settings. If you create multiple configuration settings, you can use the _configUse to switch the active configuration. To list all available configuration settings, use the _configList command. Run the following command to confirm you can connect to the Azure IoT Hub; no records will be returned yet as we have not yet configured our monitoring environment. Each SQL Server (i.e. device) has its own Access Key into the IoT Hub; you do not need to remember this information as Enzo Unified will work from the device name (DEVLAP03-SQL2014 in my example). We are now ready to add virtual IoT Devices, so that the Azure IoT Hub can accept incoming data from your SQL Server. We will create a few virtual IoT devices for this test. You will soon see the message count go up on your Microsoft Azure IoT Hub dashboard. The above command will generate at least 12 messages and output the messages that were actually sent to the Azure IoT Hub. 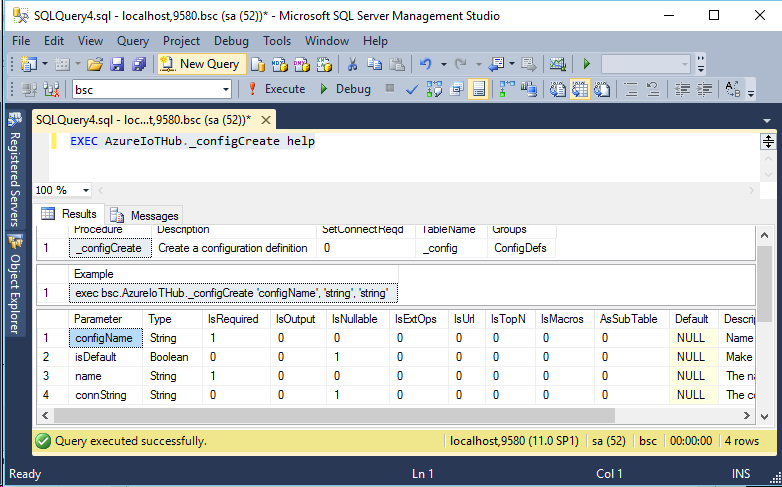 Last but not least, let’s create a similar test and save the output provided by the SendTestData method to a local table in SQL Server so that it can be analyzed later. In order to do this, we will need to call Enzo Unified through a Linked Server. In order to configure Linked Server to Enzo Unified, follow the instructions provided in the help of Enzo Unified. 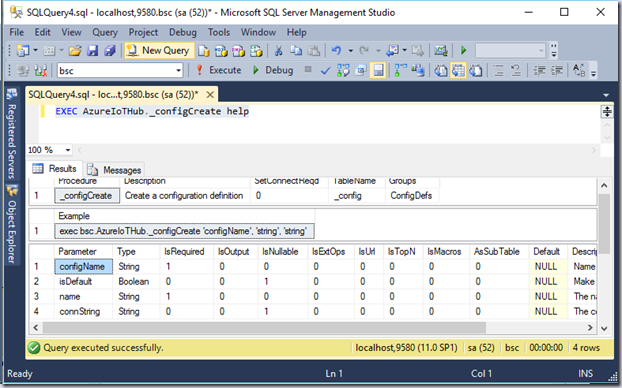 First, connect SSMS to your local SQL Server, and create a database with a table where the data will be stored. 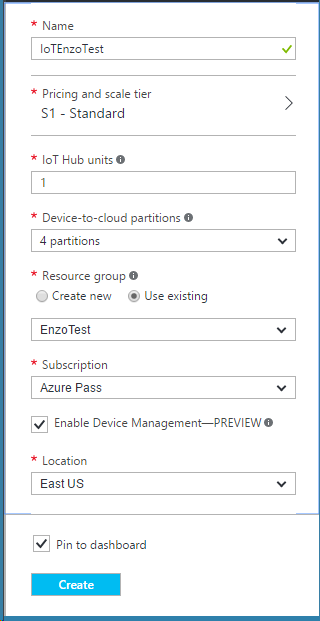 This lab introduces you to the Azure IoT Hub, Enzo Unified and its AzureHub adapter, and how to leverage SQL Server to create an ecosystem of virtual devices simulating data emission to the Microsoft Azure cloud. Herve Roggero, Microsoft Azure MVP, @hroggero, is the founder of Enzo Unified (http://www.enzounified.com/). Herve's experience includes software development, architecture, database administration and senior management with both global corporations and startup companies. Herve holds multiple certifications, including an MCDBA, MCSE, MCSD. He also holds a Master's degree in Business Administration from Indiana University. Herve is the co-author of "PRO SQL Azure" and “PRO SQL Server 2012 Practices” from Apress, aPluralSight author, and runs the Azure Florida Association.